A little randomly, at some point over the past year I decided to challenge myself and see how long I could go sewing with only white thread. I know: that really goes beyond nerdy and gets into “slightly weird” territory. Still, I was curious and thought it would be a funny goal to set for myself. I didn’t keep strict, scientific track, but I know I went a solid six weeks-ish without swapping out my bobbin for another color. Somehow, it felt like a victory. I sewed quilts, mostly, but some garments and tote bags and home dec, too. I think white or cream is always my default for piecing, so the quilts aren’t really a surprise, but even I was startled by how often white would work for interior seams on a garment or even hemming and topstitching–maybe I was just using a lot of light fabrics. Some might call this lazy. I don’t think I was being lazy–it wasn’t about being unwilling to wind a bobbin or thread the machine, since I had to do that, anyway, when I re-loaded with more white. (It isn’t as though I made an entire spool last that long, after all.) Some might call it irresponsible, saying that a “good seamstress” would always, always, always take the time to load the machine with matching thread. I must not be a “good” seamstress, then, because I know for a stone cold fact that I haven’t used anything but white in my serger for years. Plural. I think it’s fun to mix things up here and there, which maybe this is. I also think that it’s completely acceptable to break rules so long as you know why the rule is there in the first place. I have always argued that the most important thing a teacher can communicate to students is WHY you do things, rather than simply WHAT you do. If there isn’t a firm reason for me to sew with a thread color other than white, why should I bother? Honestly, I buy white in spools of 1000 yards, so I really do always have it on hand. Might as well, right? Not every day is perfect. Not every sewing project is perfect. Not every season of our lives feels perfect, and frequently, we feel as though nothing we will ever do will get us one step closer to being perfect people. There was something rebellious in sewing with only white thread for a while, something that made me feel like I was saying, “Fine, then! I won’t BE perfect!” A little Huck Finn going to hell, if you will. And now, sewing with a matching thread, taking spools out into the light to match the colors exactly, I don’t feel that I’m on a hamster wheel, struggling to keep up and prove that I’m a “good” seamstress or doing it “right.” I feel more like, because I have my teeny little rebellion under my belt, I am doing it because I choose to. That my feet are on a path of wanting, not having to. And the sewing is that much sweeter, like summer blooms wafting by on the breeze. 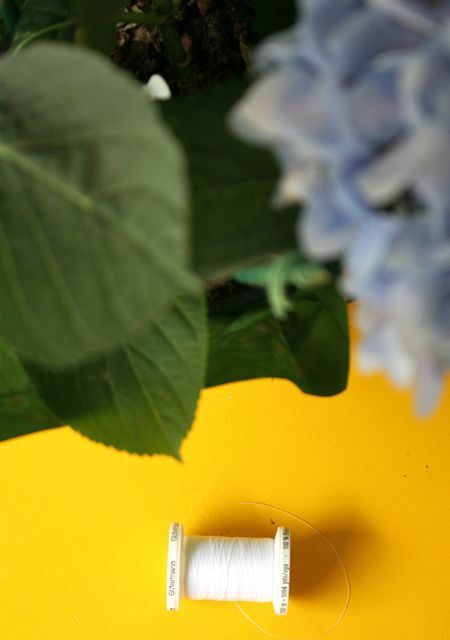 All hail the simple power of white thread. I have had white thread in my machine for over a month! I figured, Gee Wiz Wally I have a bunch of it! I never ran out of precious colored thread. Ain’t no shame, Sister. Ain’t no shame. 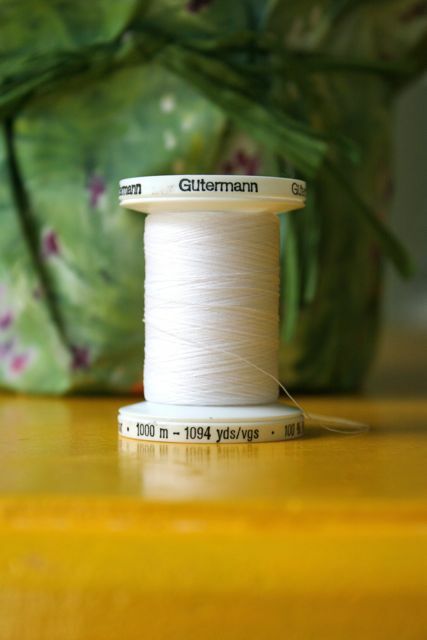 I only use two colors of bobbin thread and two colors of serger thread for all my garment sewing – white and black. If the tension is adjusted correctly the bobbin thread never shows. I bought prewound bobbins off of Ebay for my Pfaff. I haven’t wound a bobbin in years. Nobody looks underneath my topstitching to check out my bobbin color. I just had to get over the perfectionist in me that wanted to wind all those bobbins. I really enjoys always having my machines ready to go. One serger is thread with black: the other with white. I’m so glad to see I’m not the only person who has limited serger thread. I have white, black and off white. When the off white runs out I’m not repurchasing, it’s too close to white. No one looks inside my cloths anyway. I recently couldn’t be bothered winding a new bobbin when it ran out of a coloured thread, so just popped a white one in. It felt so good to not have the interruption! I used to religiously match thread to each fabric. I’ve got a reasonable collection of thread now (maybe 40 colours) and I’m amazed how I always have something that is close enough these days. Bobbins have been wound for most of them already, so when the sewing whim takes me, I can just get on with it. Such a nice feeling! Love this! It is very liberating to not have to be perfect!!!!! I get so much more accomplished! Hooray! Good for you for “breaking the rules”. It is your sewing, you can do whatever you want.